Caldecote v Kempston Rovers Development. Picture: David Kay. Sodiq Thompson with a brace plus single goals from Temitayo Akerele, Henry Munewira and Adam Marsh brought up the home nap hand against Town replies via Dan Stafford, Phil Matthews and Ritchie Bevan. This defeat saw Town drop to third in the Premier Division supported by Sportsform and overtaken by Shefford Town & Campton who extended their unbeaten home ways with a 5-1 victory over Wootton Blue Cross. Lewis Taylor with a brace plus single strikes from Mitchell Foley, Jake Renney and Rick Young marked the home scoresheet against a lone Blue Cross reply from Dale Armitage. Whilst now in fourth are Caldecote who also extended their unbeaten home ways in beating Kempston Rovers Development 4-2. Sam Julian, Dan Fennell, Oscar Smith and Carl Heath netted the home goals against Rovers replies via Paul Garrett and Gary Stevens. This defeat dropped the Rovers into the relegation zone after Queens Park Crescents jumped above them with a 5-3 away win at Cranfield United. Fabio Sattar and Daniel Rasol both netting twice and Serge Kadji the once against United replies via Shaun Barnett, Mark Smith and Max Marsh. Elsewhere, Stevington are unbeaten in their last five starts after sharing the spoils in a 1-1 home draw with AFC Kempston Town & Bedford College, Martin Danoberga on the home scoresheet and Aaron Chaplin replying for the visitors. 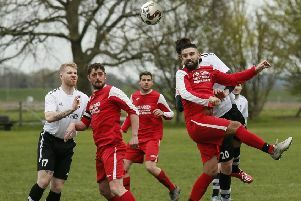 For Ickwell & Old Warden it was the gift of three points after Renhold United failed to raise a side to visit them on The Green whilst waterlogged pitches saw the games Marston Shelton Rovers v AFC Oakley M&DH and Sharnbrook v Wilstead postponed. Totternhoe Reserves’ lead in Division One supported by O’Neills is now down to just five points after they lost their 15 game unbeaten run when beaten 4-3 at Flitwick Town Reserves who were extending their own unbeaten home run up to six games. Josh Arthur Kent, Dan Parker, Dom Collins plus an own goal marked the home scoresheet against an own goal plus a brace from Tom Curry marking the league leaders’ scoresheet. All of which was good news for second place Riseley Sports who took their unbeaten record up to 11 games with a 2-1 home win over Shefford Town & Campton Reserves. Sam Harrison and Jake Hislop netted for the Sportsmen and Colin Standley replying for the Town. Whilst third place Wixams also closed the gap on the league leaders with a 3-1 victory at Meltis Albion, Gareth White, Dale Goldie and Liam Massey netting the goals to do the damage against a lone Albion reply via Stanley Gonese. However the highest scorers of the day were Cople & Bedford SA who ran out 6-3 home winners over bottom of the table The 61 FC Luton Reserves. Luke Wilson and Lucas Banton both hit braces to go alongside single goals for James Fay and Daniel Bond against 61FC replies via Kane Dempsey twice and Ross Scott once. AFC Kempston Town & Bedford College Reserves extended their unbeaten home run up to four games in beating Henlow 4-3. Jessie Sidhu with a brace plus goals from Charlie Corcoran and Kurtis Alleyne were on the Town scoresheet against Henlow replies via Antony Bowskill twice and Adam Walker once. Elsewhere there was also home joy for Lea Sports PSG who netted win number four on the bounce to beat Sandy 3-0. Joe Hennem netting all three goals. Whilst Biggleswade FC Reserves had to settle for a share of the spoils in a 2-2 home draw against Cranfield United Reserves, Ewan Smales and John Veal on the home scoresheet against United replies via Jordan Conway and Joe Bygraves. Henlow Reserves’ lead at the head of Division Two is down to just goal difference after they were held to a 3-3 home draw by Caldecote Reserves. Russell Ayles, James Campbell and Matty Heneghan were on the home scoresheet against visiting replies via Nicky Thomas twice and Nicky Albone once. Whilst second place Bedford Albion took full advantage by winning 4-1 at Sundon Park Rovers - Paul Babbington, Michael Peters, Josh Emmerton and Jack Brown all finding the back of the net against a lone Rovers reply from Ethan Tenn.
For third place Houghton Athletic it was a 3-1 away win at CS Rovers, Antony Neeves with a brace plus a goal from Jordan Thomas doing the damage against a lone Rovers reply via Mark Moriarty. The biggest win of the day went to fourth place Wilstead Reserves, 7-0 home winners over Atletico Europa. Luke Prietzel led the way with a hat-trick, Liam Fenton netted a brace and they were joined on the scoresheet by single strikes from Chris Marciano and Dale Clegg. Meantime for Marston Shelton Rovers Reserves it was the gift of three points after Renhold United Reserves failed to raise a side to entertain them and likewise Westoning were gifted three points when opponents Wixams Wanderers failed to raise a side. The AFC Oakley M&DH Reserves v Elstow Abbey game failed to beat a pitch inspection and was duly postponed. There is no change in Division Three following wins for the top three clubs. Kempston Athletic remain six points clear after they took their unbeaten ways up to nine games in winning 5-1 at Dinamo Flitwick. Josh St Clair Pierre and Craig Damon both netted twice and Richie Andrews once to bring up the nap hand against a lone home reply from Daniel Day. Whilst second place Clifton are also now unbeaten in their last nine starts following their 5-2 home win over Flitwick Town A. George McMillan with a brace was joined on the home scoresheet by single strikes from Dylan Donaldson, Kyle Davies and James Bell against a brace in reply from Town’s James Bell. Completing the trio of clubs now unbeaten in their last nine starts are third place Harlington who were 10-0 home winners over Stevington Reserves. Farrell Whitman, Evan Tracey and Shea Gentle-King all netted twice to go alongside single goals for Roan Wedderburn, Ryan Martin, Reginald Miongoti and Dragos Suitana. Also enjoying home life were Caldecote A who took their unbeaten ways up to six games with a 2-0 victory over bottom of the table Wootton Village, Tony Norman netting both goals. Whilst Shefford Town & Campton A were the 4-0 home victors over AFC Kempston Town & Bedford College A. Garth Head and Josh Lummis both netting braces to do the damage. Elsewhere Lidlington United Sports ran out the 2-1 away winners at White Eagles. Carl Pearson and Edward Janes with early second half goals fired them 2-0 ahead before Jan Bucur netted for the Eagles in the 66th minute. The Bedford Albion Reserves v Black Swan game was waterlogged off. Bedfordshire Saturday Youth side Flitwick Eagles will now face a second round tie at Black Swan or Wootton Village after they ran out 1-0 home winners over Sandy Reserves thanks to a goal from Callum Evans.